GGE. The Genetic Generalized Epilepsies (GGE) are common epilepsies in children and adults with a prominent genetic contribution. However, genetic risk factors for GGE have been more difficult than most researchers would have expected to pin down. Genome-wide association studies for common variants and association studies for ultra-rare variants have been able to identify several candidate genes, but much of the genetic risk for GGE remain unaccounted for. In a recent study in Lancet Neurology, we have tried a different approach to address the genetic contribution for GGE, looking at gene groups rather than single genes. Using this approach, we were able to detect a signal that would not have been found when looking at individual genes alone, a contribution of rare variants in genes for GABA-A receptors that reliably spans across three different cohorts. Figure. Discovery and confirmation of the association signal for rare variants in the gene set for GABA-A receptors. Copy of Table 1 from the publication by May and collaborators. Only the gene group of GABA-A receptors shows an association signal in the discovery EuroEPINOMICS CoGIE cohort. This association is subsequently confirmed in two additional cohorts. No single gene was significantly associated with GGE in the discovery cohort. [permission for reproduction granted by Elsevier]. GGE Genetics. Even though the Idiopathic Generalized Epilepsies (IGE) have been renamed Genetic Generalized Epilepsies (GGE), the usage of the adjective “genetic” sometimes feels like a mirage. Common GGE subtypes including Childhood Absence Epilepsy (CAE) and Juvenile Myoclonic Epilepsy (JME) have one of the highest heritability estimates of all neurodevelopmental disorders, but our understanding of the underlying genetic risk factors is relatively modest. Rare monogenic families with pathogenic variants in GABRG2 and GABRA1 have been found, microdeletions at 15q13.3, 16p13.11, and 15q11.2 have been found to be associated, and common variants in VRK/FANCL have previously been suggested. A recent genome-wide burden analysis identified ultra-rare variants in KEAP1, COPB1, and CACNA1B to be associated with GGE. Collectively, however, these risk factors likely account for far less than 5% of the overall genetic risk for GGE. Why so few genes? The lack of known risk genetic risk factors is likely due to the genetic architecture of the GGE, which is likely comprised of variants that are either strong, but too rare, or common and too weak to be identified through current methods and sample sizes. Several tens of thousands of patients are likely needed to identify GGE risk variants that explain a significant proportion. When you let this sobering statement sink in for a moment, it becomes clear that this applies for hypothesis-free testing on a genome-wide basis. Candidate gene studies that focus on a single specific gene have fallen out of favor in the genomics world as these studies have traditionally been biased towards false positive results. However, if meaningfully combined with a rigorous validation plan, the general concept of these studies still remains applicable. GABA-A receptors. Our recent study by May and collaborators uses a hybrid approach to identify gene groups for GGE. We were not able to identify any single gene that is associated with GGE in cohort of 152 cases and 569 controls that have been exome-sequenced as part of the EuroEPINOMICS CoGIE project – this is not surprising given the relatively modest size of this cohort. 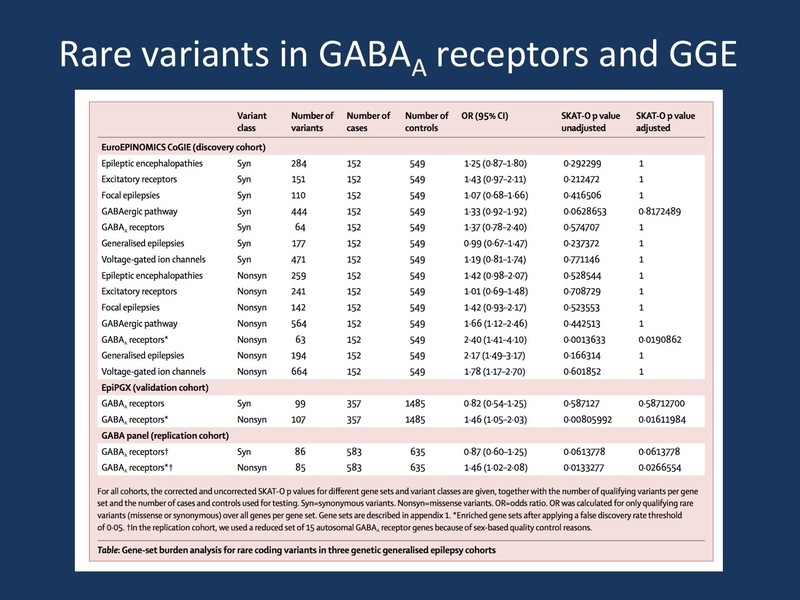 However, when we looked at gene groups, we identified a signal for rare variants in genes encoding GABA-A receptor subunits. The association signal was not present for six other epilepsy-related gene sets. The association signal was surprisingly strong with and Odds Ratio of 2.4, which helped to push this association across the threshold. Validation. The same gene set was subsequently tested in two other, entirely independent cohorts, the EPIPGX cohort that was recruited for pharmacogenomic studies, and a third joint Canadian-European cohort of GGE patients. The signal for the group of 19 GABA-A receptor subunit encoding genes could be found in both groups, suggesting that the initial association was not due to chance. Novel GGE genes. For two GABA-A receptor subunit genes not previously associated with GGE (GABRB2 and GABRA5), functional studies were performed, which showed a loss-of-function effect for most variants studies. This functional validation suggests that the overall design of this study was able to identify variants that impact the function of the respective GABA-A receptor. While this is not necessarily a proof that each of these genes is a causative gene for human epilepsies, it represents an interesting method to identify novel candidate genes through a gene-group approach. What you need to know. One way to approach the elusive genetic architecture of the GGEs is to assess the role of gene groups or gene sets rather than asking for the contribution of single genes in isolation. In a recent study in Lancet Neurology, we were able to detect a stable signal of rare variants in genes encoding GABA-A receptor subunits that are associated with GGE. This finding adds to the growing suspicion that dysregulation in GABAergic synapses may be one of the key drivers behind the biology of GGE. This entry was posted in 2018, EuroEPINOMICS and tagged GABA-A receptor, IGE/GGE. Bookmark the permalink.